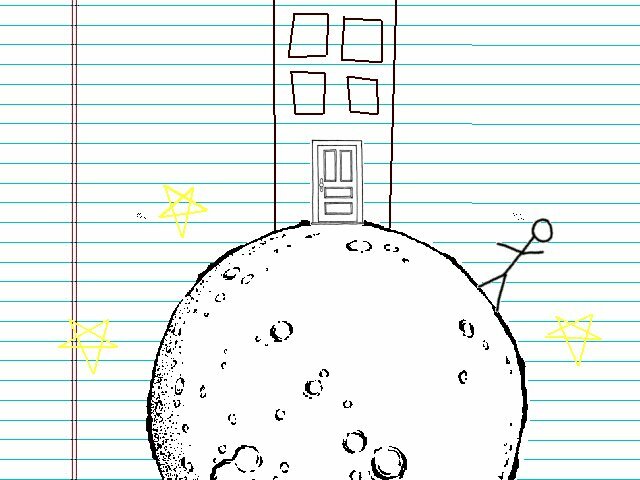 Does anyone remember an old windows or dos game where you were a stick man on some lined paper and you went to the moon and gravity was similar to Mario Galaxy and you could go full circle round the moon ? And there were craters and flags I think, you had to collect stuff, stars or coins or something. I think there was buildings. It was back in the XP days, or possibly before, maybe late 90's, early 2000's? I think also there was an elevator to the moon, but if you ran down to the bottom of the moon, you could jump back down to earth and in the process flip around so you were the right way up. oh, it was a 2d platformer type thingy.
! Nope!! ... Sounds fun though.. You should make that!! I sort of remember a game like that. As for the name of it though, my collander-esque memory is proving to be rather effective. |edit| I tried doing an image search based off the above mockup, all google gave me was graphs. Did the planet rotate as you walked, or did the chr walk around the static planet? Are you sure it wasn't "Doodle Earth - A 99 Moon Game" on iOS? Well, that's probably the closest to your description that we're going to get! I sort of remember you being WIP with that game Jay.